To develop a personalized program for each patient that will cultivate the restoration of function by means of minimally invasive pain management approaches, non-narcotic medication management, and physical therapy. Physiatrists, or rehabilitation physicians, are nerve, muscle, and bone experts who treat injuries or illnesses that affect how you move. 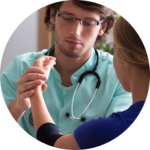 Rehabilitation physicians take the time needed to accurately pinpoint the source of an ailment. They then design a treatment plan that can be carried out by the patients themselves or with the help of the rehabilitation physician’s medical team. This medical team might include other physicians and health professionals, such as neurologists, orthopedic surgeons, and physical therapists. By providing an appropriate treatment plan, rehabilitation physicians help patients stay as active as possible at any age. Their broad medical expertise allows them to treat disabling conditions throughout a person’s lifetime. Monte Rommelman, MD’s specialty in Physical Medicine and Rehabilitation offers a minimally invasive, non-narcotic approach to pain management with the focus of treating and eliminating the pain that his patients have. With the added services of Physical Therapy, Massage, and Dietary Counseling, we offer a program that identifies the individual need of each patient and then tailor the program to foster a successful recovery.